Sunrise over Konya is awe-inspiring, particularly when one views it from the top of a 18-storey building. 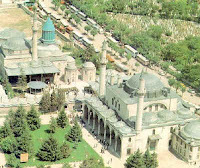 We’re searching for the silhouette of the tomb of the Mevlana — as the Sufi Master Jalaluddin Rumi is known here. "It lies too far towards the East" the concierge informs us. "Take a taxi." The visit to the green-turreted tomb of the Master turns out to be the most relaxing part of our whirlwind-tour of Turkey. The Mausoleum is also a museum which has among its treasures the first manuscript of the Masnavi. Widely regarded as the greatest Sufi poem ever written, this was composed during the last years of Rumi’s life. The circumstances under which the 25,000-verse-long poem came into being are illuminating. One night, finding him alone, Husamuddin Chelebi, Rumi’s closest disciple, bowed and asked if the Master would compose something that "might easily be memorised and serve as a companion of the souls of the lovers (of the Faith and Union) so that they would occupy themselves with nothing else". At that very moment, from the top of his blessed turban the Master is said to have taken out a piece of paper. On it were written the first eighteen couplets of the Masnavi, beginning with the lament of the reed. "If you will write them down I shall dictate the verses that are to follow," said the Master and Chelebi joyfully agreed. That is how the Masnavi came to be written down over a 12-year period that ended with the Master’s death. The first manuscript of the Masnavi, finished within five years of the Master’s demise, is displayed in a room adjoining the tomb. It opens with "the story told by the reed of being separated" (in Coleman Barks’ 1994 translation). Later, over a steaming cup of kahve in a café on Sultanahmet Street, a Turkish friend explains to us the nuances of the image. "The central metaphor of the reed-flute symbolises the music of the Mevlana’s own heart. Burning with love and yearning, it always longs for the Beloved. So it sings like the reed-flute," he explains. Rumi, the poet of lovers, seems to experience separation and company, sorrow and rejoicing all at the same time and is wishful of sharing the flood of feelings for the beloved with the song of the reed’s plaintive notes, he adds. We have something similar here from Bhakti poets ranging from Andal to Meera. The rain cloud symbolises longing for one; a crow for another. All maddened with Divine Love. Those of the East and the West have been unaware that it was the manifestation of the Work of the Sufis that culminated in the Signs and Wonders of Mary of Fatimah that are now to be revealed. In 1917 when Russia was taken by the armies of the false prophet Karl Marx for the coming 70 years of their Babylonian Captivity there was another Foundation set up that centered on the Sun of Fatimah: the Emanation of the Sun of Tabriz. In the Lamb's book I have written that the 3 Children of Mary of Fatimah when seen in their Unity represent the Door of the Sheep; the Image of the Lamb; the Mahdi himself. The Door of the Ark of Noah had 3 levels; just as the 3 Children represented the 3 Faiths of the Earth: as representing the 3 Sons of Noah that came into the Ark first. The Son of Maryam al-Kubra thus stands in his Unity of the 3 Faiths as the Pearl of Great Price; the Pearl of Khidr Rumi; the Gate of Heaven itself. Fatimah in Portugal thus is the Bethlehem of Islam; a center of Pilgrimage long before 1917; as Ibn el-Arabi and Rumi both were associates of Khidr Elias: the Green One; who brought in the Whirling Sun of Fatimah the 3 Sings that are were the first impact of the Sun of Faith that came to the earth as the Work of the Sun of Tabriz and Khidr Rumi. It was here that I was given the Seal of Universal Prophethood in the Assembly of the Righteous; and began to bring to the earth the knowledge of the Last Day of Islam and the advent of the Masih ad-Dajjal: Osama bin Laden; another "Old Man of the Mountain"; the Thief; the Judas of Islam. The Goodman of the House of Saud should have watched his House, that it not be broken up: for the Muslims will do no better at the Second Coming with the Mahdi than the Jews did at the First Coming. The 3 Signs and the accompanying Wonder of the Sun of Fatimah in Portugal in 1917 were then the Work of the Sun of Tabriz; as all the Sufis work together in Concert; no matter what it might look like to an outsider; the Work of the Sufis was then to be seen in it's first major effect after the Son of Maryam al-Kubra who the Muslims call the Mahdi and Christians the Messiah; but this confusion is due to the Hidden One who represents the Door of the Ark; the Mahdi himself; the Holy Child. The Archangel who gave the Host to the 3 Children of Mary of Fatimah thus produced the 3 Whirlings of the Sun of Khidr Rumi that were the Emantion of the Work of the Sun whereby the Baraka of Muhammed came down upon the Offspring of the Daughter of Muhammed; the Virgin of Light known as Fatimah al Zahra. Fifty years later in 1967 the 3 Cities of Faith felt the Second Emanation of Shams of Fabriz; for when Israel broke the yoke of Mecca off the shoulder of Jerusalem in the 144 hours of the 6 Days War it was the City of St. Francis that suddenly became the New Mecca: the New Jerusalem. In that Summer of Peace and Love in my City were seen the opposite of the Six Days War and Hate of the Arabs abd the Jews who missed the Visitation of God at the Golden gate of Fatimah that was seen in the Pilgrimage to the City of the Sun of Tabriz: where the Nazarenes and Zealots of Jesus Day in Jerusalem were seen in that Generation as the reborn peace-loving Nazarenes and warlike Radicals in the Spiritual Contemporay of Khidr Rumi known as St. Francis; whose Soul was the Bride of Islam.